Death Traps is an unusual book. It is written in the style of a memoir, but it also presents itself as a history of the 3rd Armored Division, the unit in which Cooper served as an ordnance Lieutenant. 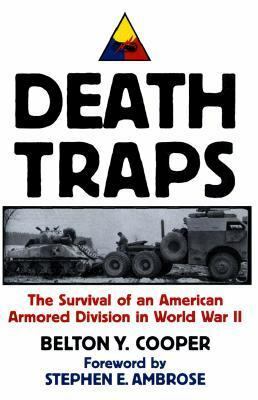 The main theme of the book is that M4 Sherman was, as the title implies, a “death trap” to the men that operated them. However, the book has several flaws. As a memoir, it is meandering and repetitive, far too often wandering away from the authors personal experiences into the realm of speculation. As a history it is lacking, containing no end notes, foot notes or bibliography. And finally, as an indictment of the M4 Sherman tank, the book is filled with so many factual errors and outright falsehoods, it cannot be taken seriously on this count either. The most interesting and valuable parts of the book are where Cooper sticks to his personal experiences as an ordnance officer. The insights he gives into the daily life of the 3rd Armored Division and its soldiers are intriguing, although they make up too little of the books three hundred pages. Of particular interest to armor and tank enthusiasts is his writings concerning the “Super Pershing” project, with which he was personally involved. The story concerning M4 crews who inadvertently stretched out the retaining clips for the main gun ammunition by stashing bottles of cognac inside them is amusing and no doubt of interest to people wanting to know more about the day to day life of Sherman crews. However, there are not enough of these sorts of stories in the book. Instead, the reader is subjected to Mr. Cooper veering off into stories he had heard second hand or into broader topics only loosely related to his experiences. For example, the reader is forced to endure Mr. Coopers opinion on everything from German V2 rockets and jet fighters to General George Patton’s (supposed) influence on US tank design. Another aspect of the book that becomes rather frustrating is the authors frequent and persistent hyperbole. Everything is overstated. For example, when the author witnesses an aerial battle between US bombers and German fighters, it is described as “the most spectacular aerial battle of the war.” His admiration for the German opponent seems to know no limits, referring to the German General staff as “brilliant” (for creating the Siegfried line!?) He states that “Military historians have often agreed that until you’ve fought the German Army, you have never fought a real battle.” This statement is of on its face absurd (and potentially insulting to his brothers in arms in the Pacific campaign.) When the author relates how he was forced to take command of an armored column and assume a position outside of Mons, he feels it necessary to tell the reader “I have often reflected on the significance of our position at this road junction on the outcome of the battle of Mons.” Seeing as the column the author was commanding did not encounter the enemy, the significance of the action would appear to most reasonable readers to be fairly minimal. In regards to the main thesis of this book, that the M4 Sherman was a “death trap”, the author relies on a fairly narrow sets of figures and anecdotes, which he repeats multiple times throughout the book. Unfortunately, his writings display a surprising level of ignorance about the weapon systems of which he speaks. Names and designations are repeatedly misidentified, and basic information regarding the performance of various weapon systems are presented incorrectly. Granted, in most soldier memoirs, errors on technical matters are bound to crop up. This is expected and forgivable. However, Death Traps is not just a soldiers memoir. It is an intentional indictment by an ordnance officer concerning the primary piece of equipment he was charged with being responsible for. Therefore, one would expect more care to be taken to ensure that the facts presented regarding the subject of the book would in fact be correct. Below are a list of technical errors found in the book. Some of these are relatively trivial, while others are far less forgivable and undermine the authors credibility on the topic. Cooper lays the blame on the delay of getting the M26 Pershing into service in Western Europe on the influence and judgment of General George Patton. As a field commander, Patton has little influence on such decisions. Most books on this topic lay the blame at the feel of General Leslie McNair, commander of US Army Ground Forces, responsible for the organization, training and preparation of the U.S. Army for overseas service. Cooper repeatedly misidentifies German cannons, referring to the PaK 40 anti-tank gun and the Kwk 40 tank gun as the Pak 41 and Kwk 41. This is a rather small error and forgivable. More egregious is his stating that the “Kwk41” was superior to the M1 76mm gun found on later models of the M4 Sherman. The two guns were actually almost indistinguishable from each other in terms of armor piercing performance when using the most common AP rounds available at the time. Cooper repeatedly refers to the 75mm gun that equipped the M4 Sherman as the “M2.” The M2 75mm gun was a shorter version that was used in early versions of the M3 medium tank. This gun was never used in any production version of the Sherman, they all had the longer M3 75mm gun. He confuses the engines mounted in various models of the M4. While he correctly states that the Continental R975 Radial engine powers the M4, he incorrectly identifies the engine in the M4A1 as the Ford GAA. This error is rather odd since he also refers to the M4A1 as “essentially the same tank as the M4 but with an improved high-velocity 76mm gun and a different turret.” (page 24) Actually, the M4A1 came with either the 75 or 76mm guns, the difference between an M4 and a M4A1 was that the M4 had a welded hull, the M4A1 had a cast hull. Both the M4 and the M4A1 had the R975 radial engine. Cooper seems rather confused as to the details of the Ford GAA and GAF series of engines. He repeatedly states their HP rating as 550. This is incorrect, most sources list maximum gross HP at 500 and net HP at 450. Cooper refers to the Ford engine as a V8 in reference to it in the Sherman (page 79), but in the Pershing it somehow becomes an inline 8 (page 213). He also claims that “Ford Motor Company, under the direction of the ordnance department, had taken the British Rolls Royce Merlin engine and cut it down to eight cylinders.” This is completely untrue. The Ford design was similar to the Merlin, but it was not a copy. It was an original Ford design, created as a 12 cylinder airplane engine. Ford cut the engine down to 8 cylinders to adapt it for service in tanks. Cooper states that “the power ratio of the M26 was approximately 12 horsepower per ton compared to 10 horsepower per ton on the M4” and that the M26 was “faster and more agile over rough terrain.” (page 26) He has the power to weight figures all wrong. According to Hunnicutts books “Sherman” and “Pershing”, the M4 and the M4A1 had a gross power to weight ratio of 12 HP per ton. The Pershing had a gross power to weight ratio of 10.8 HP per ton. When we throw the M4A3 into the mix, the numbers look even worse for Pershing, as the A3 had a gross power to weight ratio of 13.5 HP per ton. The M26 was always regarded as an underpowered vehicle until it was upgraded to the M-46. Cooper seems very confused on the topic of suspensions. For example, he states: “The (Pershing) track was supported by large, overlapping bogey wheels suspended on torsion bar spring systems. This was the old Christy (sic) system, which had been developed by the Americans some twenty years previously and had been adopted by the Germans and the Russians. The Christy (sic) system allowed amuch wider track, and also the torsion bar syspension had a greater amplitude than the old coil spring system on the M4 Sherman. This system permitted a much easier ride over rough terrain at higher speeds, and the increased amplitude gave the tank better traction going over rough ground or ascending rugged slopes. All American tanks that came after the M-26 Pershing used the Christy (sic) system.” (page 211) This paragraph is riddled with errors. First, “Christy” is not the correct spelling, the proper spelling is “Christie” as in Walter J. Christie, the man you invented this form of suspension. It should also be noted that the Christie suspension did not use torsion bars as Cooper states but rather coil springs. Interestingly, Cooper does mention coil springs, but instead of doing so in reference to the Christie system, he does so in reference to the M4. Of course, the M4 suspension used volute springs, not coil springs, so that is incorrect as well. The Germans never used the Christie suspension, instead relying primarily on either leaf springs or torsion bars. The only countries that actually used the Christie suspension were the Russians, as Cooper correctly states, and the British, who Cooper neglects to mention. After WW2 both Russia and the UK abandoned the use of Christie style suspensions do to the fact that they were outdated. The US army has never used the Christie suspension system in any of their WW2 or post war tank designs. Cooper states that the “Sherman had to get within six hundred yards of the Panther and hope to catch it on the flank” in order to knock it out. The side armor on a Panther was actually comparatively thin, being 45mm on the turret side and 40mm on the hull side. This meant that the Panther could be penetrated through the side at normal battlefield ranges by both the 75 and 76 mm guns of the M4 Sherman. The above list is some, but not all, of the demonstrably incorrect facts presented in the book. Next I want to look at claims made in the book that just seem odd. I cannot prove these to be incorrect, but they don’t pass the smell test. Cooper claims that on July 11 the German Panzer Lehr division attacked US forces near St. Lo using Jagdpanthers. It is extremely unlikely that Jagdpanthers were used in this attack. Most likely Cooper has confused Jagdpanther with the more general term Jagdpanzer (tank destroyer). Cooper presents this attack as “one of the most critical in the battle of Normandy. The Germans launched a massive counterattack along the Saint-Lo-Saint Jean de Daye highway in an attempt to capture Carentan and Isigny and split the First Army in two.” This description is a gross exaggeration on the part of Cooper. The July 11 counter attack is generally considered a relatively minor event in the overall Normandy campaign. The Panzer Lehr division lost 20 tanks in this attack while inflicting only light casualties on US forces. Cooper seems to have a fixation with M12 self propelled guns destroying German tanks. In the book, he only gives a few examples of actual tank on tank duels. Oddly enough, two of these involve the M12. Without a way to confirm or disprove these claims, I will simply let the reader make their own judgment on the plausibility of these stories. For the sake of my own sanity, I am going to leave my review of “Death Traps” here for the moment. Consider this “Part 1.” At some point I’ll pick this up again with a more detailed explanation of why the armor and firepower advantages of German Armor which Cooper mentions continuously in his book did not actually translate into German armored units being more combat effective than US armored units. Also, just to make this perfectly clear, I am not criticizing Mr. Cooper’s service to his country or his character. I am criticizing his book, not him. All true, though I think Cooper could be forgiven for the “Christy” thing. As Christie was one of – if not the – first to use independently sprung roadwheels, engineers of the period did allegedly refer to any such system as a “Christie” suspension, regardless of the means used to spring the wheels. I might add that in his discussion of the power-to-weight ratio of the Sherman vs the Pershing, Cooper is grossly manipulating the numbers to fit his agenda. Thanks for the comment C.H. I understand what you saying, I have run into people that work in the defense industry that will refer to any suspension without return rollers as a “Christie suspension.” I agree that it’s not the biggest or most serious error in the Deathtraps book. Over at the WoT Forum, their chief North American researcher Nick Moran “The Chieftain” expressed similar concerns about the book in a forum thread. In that thread, The Chieftain posts a comment from Zaloga in which he states that the name of the ghost writer is Mike Benninghof. I am not very familiar with Benninghof’s work, but according to wikipedia he has a PhD in History and is a well known military simulation game designer. Probably the harshest indictment of the book I have seen is Robert Forczyk’s Amazon review of the book. Forczyk is a former armor officer and historian who has written some very good good books on armored warfare on the Eastern Front. Sorry, Robert Forczyk ripped into the historical accuracy and credibility of someone else’s book? Sorry, I find that incredibly funny. Have you read Forczyk’s book on Sealion? The one where he believes that the German navy would have been able to fend off the Royal Navy destroyers in the channel due to the superior power of their 20mm cannons? The one where he suggests that the Germans could have realistically captured and held the Isle of Wight using a destroyer based dawn invasion before landing panzers at a ‘port’ that is slightly bigger in real life than the boat ramp you use to go fishing, while the British command waved their hands in confusion because that is clearly what senior British officers actually do when placed in charge of tasks they clearly had time to prepare for. Also where the Germans would have been resupplied with ‘Thunder Runs’ by the same destroyers. Not saying his views on ‘Death Traps’ are not correct, just that I find it amusing that young Robert feels confident enough to rip into others given some of the utterly absurd words published in his own name. Maybe his Russian Front stuff is better, but his Sealion book reads almost like he hated his editor and was trying to see just how much rot he could get away with. I have been seeing this guy show up in documentaries for years on various WW2 subjects. Today is the first time I have ever heard he was an officer. In the past he has shown up saying he was a tank mechanic that welded a bar on the front of Sherman tanks just after the D-day invasion. He plainly stated “some other GI had invented it. A short time later he shows up saying he invented it. Has anyone verified his background? I am not certain this guy ever served in WW2. An interesting response. There are a number of technical inaccuracies in this arctile that you may wish to address. 3) The Pnz Kpfw IV Ausf F, G & H (most often encountered in Normandy) had fitted as standard, a 20mm wider track (400mm) than the E series , which significantly reduced the ground pressure (from 10.7 to 10.1 psi). It never used Grousers. It was 23.5 metric tonnes, not 28. The lower glacis plate (the larger target area) was sloped at 65 degrees, giving an apparent armor thickness of ~90mm or 3.54″. Only the drivers visor plate was set at 90 degrees, and this offered a very small target. [Encyclopedia of German Tanks of World War Two – Chamberlain & Doyle, Janes Tanks of WWII]. 4) In ‘British and American Tanks of World War II’ by Chamberlain and Ellis, the 75mm M2A2 gun is listed as fitted to variants of the M4A2 Sherman. 10) The Pnz Kpfw V Panther Ausf G had a side armour thickness of 50mm and a turret thickness of 45mm, both at 65 degrees giving an apparent armour thickness of 50 & 55mm [Encyclopedia of German Tanks of World War Two – Chamberlain & Doyle]. For this penetration using a 75mm Gun M3 firing AP ammo the range would be ~1000 yards when perpendicular to the tank or ~600 yards if at a 30 degree angle [‘British and American Tanks of World War II’ by Chamberlain and Ellis]. As for other irregularities, many authors confuse German self propelled guns. I have seen a photograph of a Renault R-35 10.5cm leFH18 in Normandy that is labled Jagdpanther. It may be that the M12 155mm gun destroying a Tiger Tank is quite plausible as the Russians proudly proclaim that their first destruction of a Tiger I by a ‘gun’ was using a 122mm A-19S M1931/4 Corps Gun, which is a fixed artillery piece with a similarly limited traverse. Interestingly it ‘blew’ the turret off the Tiger I firing HE rounds. I also suggest you read ‘D-Day: The battle for Normandy’ by Antony Beevor. It highlights the unusual behaviour of sending M4 Shermans to the front line with a crew of three. Understantably, their life expectancy was not high. As for a 5 to 1 kill ratio, the greatest US Tank ace of WW2, Lafayette G. Pool, who managed 12 confirmed Tank kills in Shermans. Kurt Knispel, the greatest German Tiger ace, managed 168. 3) Please do a google search for “Winterketten” or “Ostketten”. You will find plenty of pictures of Panzer IV tanks with tracks with grouser extensions. As to the point about sloped armor, the thickest armor on the front of the Panzer IV is not sloped to a degree that it significantly increased effective thickness. Anyway, it is irrelevant to Coopers claim that the Panzer IV had four inches (101mm) of armor. It did not, 100mmm frontal armor is what a Tiger I had. 4) I leafed through my copy of Chamberlain and Ellis, I saw no Sherman tanks equipped with the M2 75mm gun other than the very earliest production models. If you have a page number, I’ll check it out. The only Sherman tanks with the short barreled M2 75mm guns that I know of were the T6 prototype and “Michael”, the first M4A1 shipped to the British. Not sure what you are referring to when you say “M2A2” gun. 10) Please clarify where you are getting your penetration stats for the M61 AP for the 75mm gun. Most figures I have seen indicate 60mm of penetration or better against armor at 30 degrees at 1000m. I agree with your point that many authors confuse different models of German Self Propelled guns. It does not help their credibility much. As to your point regarding the 155mm gun being used to kill a Tiger, I am not saying it was not possible. A 155mm HE shell is going to destroy just about any tank it hits. My point was that I found it odd that Cooper tells two different stories concerning an M12 fighting German tanks considering that very few M12 SPGs were in service and they were indirect fire weapons. The example of one of these vehicles accidentally encountering a King Tiger while rounding a bend and then being able to accurately fire it’s weapon and destroy the enemy tank seems a bit dubious. 3) “Ostketten” was a completely different track where the old track was removed. It consisted of wider, one piece moulded track segments. The Sherman employed grouser shoes that were bolted onto the existing track (or what you call grouser extensions). The Panzer IV did not use grouser shoes or extensions. 65 degrees is significant as it is the angle of the side turret of the Panther tank. Note that “Winterketten” was a snow-track and is not similar in profile to the platypus grouser shoes fitted to the Sherman, which were designed for use in mud. They are not the same thing. 10) ‘Catalogue of Standard Ordnance Items’, Second Edition, 194, Volume 3, Office of the Chief of Ordnance Technical Division, Washington D.C. using figures for Homogenous (not face hardened) armour. Interestingly, comparing the figures for the 3inch M62A1 – Standard Shot, Armour-piercing, fired from the M7 tank gun, the ‘Catalogue of Standard Ordnance Items’ lists the velocity as 2,600 fps (792 m/s) and 4.3 inch (109mm) penetration of homogenous armour at 20 degrees at 500 yards. This equates to ~116mm at veritcal. The ‘German Armourments Catalogue’, Issue 2, 1944, lists the 7.5cm PaK AP39 late round as 933 m/s and 115mm penetration homogenous armour at 30 degrees at 500m. This equates to 133mm at vertical (which matches ‘Twenty Century Artillery’ by Ian Hogg). This is significantly superior, particularly in muzzle velocity. If you use the early (aka 1939) AP39 round the velocity is 792 m/s and penetration 106mm at 30 degrees at 500m. This round is equivalent to the US 1944, 3inch/76.2mm round. Unfortunately that round was well and truely superseded post 1941. Opps, I accidentally “liked” the above comment while reading it. Regardless of how you want to parse the definition of a “grouser”, it does not change my original point. Cooper tried to say that the track of the Panzer IV was wider than that of the Sherman. The fact is that both vehicles had relatively narrow tracks (420mm/total length, 373mm ground contact for most Sherman track, PzIV track has 380 or 400mm pin width, with 360 or 380 shoe width depending on model) that made necessary the use of tracks with extensions to decrease ground pressure. The first Tiger that was destroyed by the Soviets fell to a 76 mm ZiS-3. As for kill claims of Knispel or any other German tank ace, Carius himself admitted that they were pure propaganda, not to mention that comparing the kill claims of one person against the confirmed kills of another and then making a sweeping generalization based on the two numbers is just pure nonsense. Simply compare armour thickness and slope from the German and US tanks and tankdestroyers, the penetration power at range of the shells used and there you have the solid foundation of what you call a myth. I think it incredible how the author of this post can ignore the facts. In order for a tank to be a “Death Trap”, there must be some evidence that the crews of these tanks were dying in disproportionately high numbers. And there simply is no evidence of this. US armor force casualties where not unusually high. Also, US armor units overall inflicted more damage on the enemy than they received. The technical differences between the Sherman tank and it’s Axis opponent vehicles were only one in a whole slew of factors that determined the combat effectiveness of US Armored forces in WW2. No, logic shows that if there would be only one tank of a kind, and tank experts would agree on that one being a death trap, there would be no numbers needed in dying tankers. I remember reading muliple times that Sherman crews jumped out of their tank when they had a first shot on a German tank and that missed or bounced, and the tank turned the gun to aim at them. That would explain a low crew kill rate, and because the allies won the terrain they could recover and repair lots of Shermans. 1. That says nothing about the quality of the Sherman. Since US infantry for instance had incredible high casualty rates, the tankers would not stand out with also incredible high casualty rates. I refer to Huertgen forest casualty rates of 10-20% daily…for weeks. 2. The German reference to the Sherman as Tommy Lighter says enough. It is strange that the Good Guy’s were not as much protected by armour as the Bad Guy’s thanks to their leaders decisions. That is simply deceiving. This can be literally true, but in the case at hand, tank vs. tank, very very untrue. I think the modern wargames, with their super accurate simulation of armour and shells proof the ‘desired truth’ to be very false. That is true, see the above, but it was caused because new tactics had to be developed because of the failure of the Shermans. Now you are resorting to accusing US tank crews of cowardice? The only army that was abandoning tanks in large numbers in 1944-1945 was the German army, primarily due to mechanical breakdown, fuel shortage or poor training. Not at all I do resort to anything! You do resort to derailing the discussion by such an accusation! What a loss of quality this way. I refer to facts, which you choose to ignore, which shows to me you lost the argument. Comment stops here for me. I’m not even sure what you are trying to say here, the grammer is so mangled. If you are saying that experts agree that the Sherman was a “Death trap,” you would be wrong. Steven Zaloga and Nicholas Moran, both of whom are quite knowledgeable on the on the matter have explicitly denounced the Deathtrap myth. Here you are saying that US tank crews abandoned their tanks so often that it led to lower than usual crew kill rate. First off, US crews were not that cowardly. Second, we know the figures for US tank crew casualties. They are pretty much similar to the rate of crew causalities for other allied tanks in the ETO. Again, I am not sure what your point is here. If the Sherman tank was a “Death trap”, we would see casualty figures that would truly stand out compared to the rest of the frontline troops. We simply don’t see that. Tommy lighter? Every book on the topic claims they called it a “Tommy Cooker” or a “Ronson.” My suspicion is that they probably called it something in German, not an English language phrase. Anyhow, actual data shows the M4 was not particularly prone to burning compared to other tanks. Tanks are full of things that burn, and will do so when penetrated by armor piercing munitions. In fact, once the wet stowage ammo storage system was introduced, the Sherman was far less prone to “brewing up” than just about any other tank of the era. Also, modern video games prove nothing, they are entertainment, not history. So coming up with tactics to defeat the enemy is cheating? Are you saying that if a weapons system requires specific tactics in order for its effectiveness to be maximized, it’s not a good weapons system? This is a very strange notion. Anyhow, postwar studies showed that the most important factor in any particular tank on tank engagement was the tactical situation, primarily, the side that saw the enemy first and fired the first shot typically won. This factor far outweighed any technical features of the tanks involved in determining who won. When Panther tanks were handled with poor tactical skill, they lost, despite the fact that your videogames say they should have won. I see you do not understand logic and reasoning. And not ” “facts” ” either. Cooper’s book is a memoir. Using it as some kind of factual document is absurd. You need to get some actual hands on experience with the machines discussed, and/or bother to read some of the far, far better books on the subject. Hunnicutt’s books on U.S. armor would be a good start. Thank you for the reply Ernie. The fact that Cooper was there does not mean everything he says is correct. In particular, he talks about things in the book that he would have had no firsthand knowledge of as a young Lt. For example, his claims about General Patton being opposed to deployment of the Pershing tank is something that is clearly false (we know this from the archival record) and it’s information he would not have been privy to during the war. As pointed out in my piece, many of the technical details given about the Sherman and the Pershing tank in the book are wrong. This is not surprising, technical details are hard to remember 40 years after the fact. It’s also worth pointing out that the book was ghostwritten, we are not sure how much of it is Coopers words and how much are the ghostwriters. As to the bigger question of was the Sherman tank a Deathtrap? Again, the archival documents show that US tank crews did not suffer casualty rates that were particularly high compared to other frontline soldiers. In fact, a US tanker had a far greater chance of surviving than a US infantryman. That said, the ETO was a very high intensity combat zone and knocked out tanks were by no means uncommon. For the men that had to deal with the aftermath such as Cooper or your father, I can imagine that these destroyed tanks left a rather strong impression. I think you are unreasonably narrowing the reasons Cooper may have referred to the Sherman as a deathtrap. It seems far more likely to me that he simply considered that “his” Shermans were getting knocked out a lot more than the German tanks were, and weren’t up to the task of facing late war German machines on an equal basis. Which, if you can’t reliably get through the front of more common enemy tanks, and the 75mm armed Sherman could not, is perfectly true. It wasn’t an equal contest, and that is why he refers to them as he does. Even the front armour of the later Pz IVs (just the hull, not the turret) and Stug IIIG was largely 80-90mm equiv, and that was right on the limits of the Sherman 75mm….any angling by the target beyond a flat 90 degrees was liable to produce a bounce or partial pen only. Shermans weren’t terrible by any means, so I enjoy hearing people push back against claims that Shermans were worthless….but I think people are pushing too far in the opposite direction now. When it comes down to it, the tankers that served in them would have dearly loved a better version. Rewriting history has nowadays become standard. The big countries have thousands of people involved. The above article displays some of it. Why build a cumbersome Matrix if you can simple use the existing media? I must say, Armour, that I am most impressed that you care about this topic enough to keep the conversation going for something like 8 months. Personally I feel what may be more useful here is to define exactly what the phrase ‘Death Traps’ actually means. Was the M4 a tank that could eat AP for breakfast before washing it down with a HEAT chaser? No, or at least not in 44-45. During 42 in CW hands when the Germans first encountered it in battle they were rather concerned at this new big and powerful tank they were now facing, but in NW Europe the M4 was a tank that could (and was) be knocked out in combat. So that is related to tank survival. Let us now talk Crew Survival. If a tank was hit by enemy fire how easy was it for crews to exit the vehicle in emergency situations? By all account quite well. In your own examples, Armour, you mention crews bailing out of their Shermans when tactically wrong footed in one on one combat. You do not mention crews being TRAPPED in their vehicles when tactically wrong footed, which suggests the vehicle was very easy to exit in situations where one’s life depended on it. So now we play with numbers. Can we compare the survival rate of crews when a tank is ‘knocked out’ for M4 and other AFVs and see which vehicle ‘traps’ crew? Open question. I do not know if the figures are available. This would hopefully give a knocked out to KIA ratio which may provide some useful figures. However we probably also would need to start looking at ‘hit’ to ‘knocked out’ ratios as well, which may be a bit harder to get good apples to apples data for. If it does exist – open question, I do not know – we could get an idea for what AFV was best able to avoid being ‘knocked out’ from taking fire and combine them with the figures for crew survival. To me I feel we are playing with words and playing with numbers. The readings I have done (mainly related to Sherman in British service) suggests it was well known that a tank hit and penetrated was a tank that was going to burn. If you are hit then you get out. If it doesn’t burst into flames you can rethink the entire situation, but if it does then are you not mildly pleased you took the effort to get out? And if you get hit, then yes, you are going to get penetrated. People spend too much time looking at apples to oranges pen tables and believing them to be solid numbers. Your gun pens 100mm, so my 105mm armour will laugh in your face. Unfortunately that is not how it works. Do you know why at the start of the war 30mm armour basis was often selected? Because that was the thickness required to provide immunity to 13.2mm AP. Want to keep out 8mm AP? You need 15mm. (13.2mm was a French weapon doing the rounds at the time and considered a good benchmark). Unless you were something like a British Matilda you could not literally ‘tank’ enemy fire and the trick to not getting your tank knocked out was not to get shot. To be a vehicle that could shrug off incoming fire you didn’t need just ‘thicker’ armour, you needed considerably thicker armour. Late model Churchills had 6inch thick front armour and even they didn’t completely lord over the battlefield. We need to beware 100% trusting the words of veterans. Not all veterans are created equal. Not all have the same memories or the same experiences. On another forum there is a regular blog troll that uses his service number as his user name and complains constantly about the fact he was conscripted and sent to Vietnam. Paradoxically to what he claims I feel his Vietnam service was the ONLY useful think he has done in his life which is why he mentions it constantly, but he prefers to believe the right wing establishment are pure evil. Each to their own. Some people want to talk about their operational experiences. Some people don’t. Some can’t, either for emotional or security reasons. I am not saying you should never listen to what someone has to say when they are willing to share their first hand experiences, but that you need to take an adult view on the power of memory as well as understanding it is the second hand experiences that veterans are often very poorly qualified to report on. They might have taken part in a flanking attack on an enemy held village but that does not automatically mean they can successfully place that attack into a large scale operational picture or even, retelling the story 30 plus years after the event, be in a position to even correct tell you what day of the week it happened on. Cooper may not be completely wrong, but that does not automatically by extension make him completely right and hiding behind his service record does not make his claims correct any more than questioning his claims removes the importance of his history service. The point here is that if you want answers you need to question everything, and that is why many people (correctly) question Cooper’s words. The Sherman was easy to mass produce, reliable, mobile, had decent armor protection, had many useful variants, and was ahead of its time when it was first introduced. It was a SUPERB infantry killer. For these reasons, it was a great tank. For some reason, history fixates on tank vs tank combat. In reality, the Shermans fought dug in German infantry and AT guns far more often than they fought German tanks. The Sherman was a great vehicle for attacking infantry and AT guns. Having said all of this, the Sherman (especially the 75mm variants) was a weak AT weapon. The flawed US Tank Destroyer doctrine had the Shermans mostly mounting a low velocity 75mm gun. Even at point blank range, the Sherman could not penetrate a Tiger or Panther. It did do well against PZ IVs, however. Sherman optics were also not as good as German optics and it did get mired in the mud more often because of its track design. While Belton Cooper may have some facts wrong, he is correct that the Sherman was outclassed by Tigers and Panthers. However, this was largely irrelevant because the Shermans spent most of their time mauling German infantry battalions. The Sherman excelled at this. “Sherman optics not being as good as German optics” is wholly incorrect. I’ll point you towards the research Nick Moran has done – he has videos of examining the inside of the former Littlefield Collection’s Panther as well as a Sherman. Basically the typical German Panzer gunner only had a by-3 magnification sight, without any non-magnified optic. This meant that it was difficult for him to lay the gun onto the target – the commander had to direct him to do so. This took time, especially when one considers the relatively slow turret traverse of the MkV. The Sherman gunner, on the other hand, had a unity sight in addition to the telescope. This allowed him a better overall field of view to lay the weapon onto the target. The general defining factor of a Second World War tank engagement is “he who shoots first will win the fight.” Thanks to this improved setup for the gunner, the Sherman had the advantage in these scenarios. Furthermore, the 75mm is not a “low velocity” gun as Cooper claims – it was comparable to the 75 on the MkIV. Tank Destroyer doctrine had nothing to do with it – indeed as soon as Sherman was fielded, Ordnance Branch set about attempting to refit it with the 3-inch gun, which was the same weapon used by the tank destroyers. If tank destroyers are the only ones supposed to kill tanks, why try to give the tanks themselves equally potent weapons? A total of around 1500 US tank crewmen were killed in WW2 in all theaters. Cooper says he thought the Pershing would have made such a difference in the number of US tank crew deaths. This is the one big problem I had with the book. The Pershing offered maybe another inch or two of armor at best over the Shermans, and that wasn’t enought to make a difference against the German tank guns; both versions of the 88 and the long 75 would both pen the Pershing. *Maybe* the 90mm would have mattered, but not the extra armor. For the record on this topic? I am not a Sherman fan boy. I feel it was a very good tank when it came out in 1942 and sound enough to survive through 43 and… sorta… in it’s later versions, into 44. I feel however that greater importance should have been placed earlier into looking into a medium tank replacement so that by 45 something ‘better’ was entering service. Note that I said ‘medium’ tank. Pershing, at the time at least, was a ‘heavy’ and US tank operations revolved – for better or worse – around the use of medium vehicles. Simply swapping M4s for M26 vehicles and expecting the formations to operate in the same manner is over simplifying the solution. Remember that the Germans and Russians didn’t put their KVs and Tiger I/IIs into their normal tank formations. Heavy tanks went into heavy tank battalions. The rank and file got T-34s, Panthers and PzIVs.